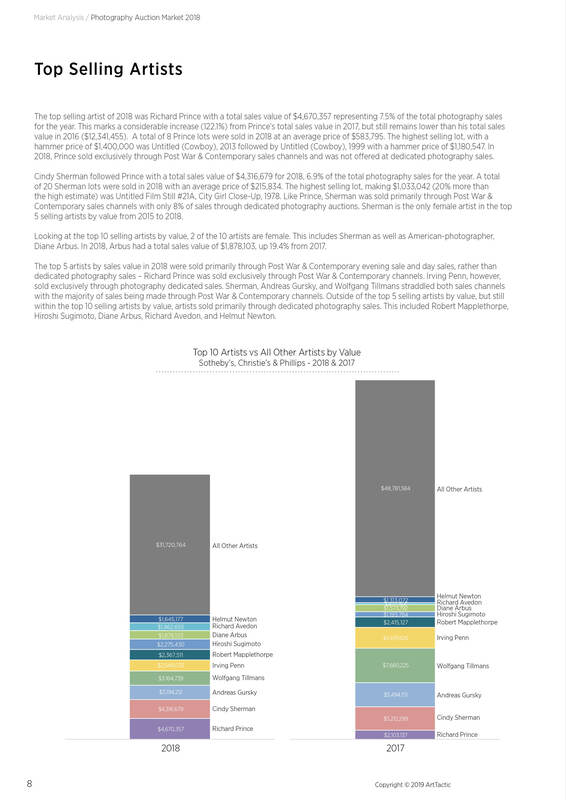 Total photography sales at Sotheby’s, Christie’s and Phillips came in at $62.3 million in 2018, down 26.5% from $84.8 million in 2017. The number of lots offered were also 11.9% lower than 2017. Although photography sales weakened in the last 12 months, it was still 9% higher than in 2016. The top five artists last year were: Richard Prince, Cindy Sherman, Andreas Gursky, Wolfgang Tillmans and Irving Penn. The photography sales by these five artists accounted for 29% of the total in 2018. Richard Prince, Cindy Sherman, Andreas Gursky and Wolfgang Tillmans generated 93% of their sales through the Post-War and Contemporary Evening and Day sales. This report presents an in-depth comparative analysis of the photography auction market at Sotheby’s, Christie’s and Phillips in 2018. The analysis also provides analytical tools looking at annual trends between 2015 and 2018. Based on feedback from our readers we have made a completely redesigned photography market report, which provides analysis of photography sold in post-war & contemporary day and evening sales in addition to the dedicated photography sales. 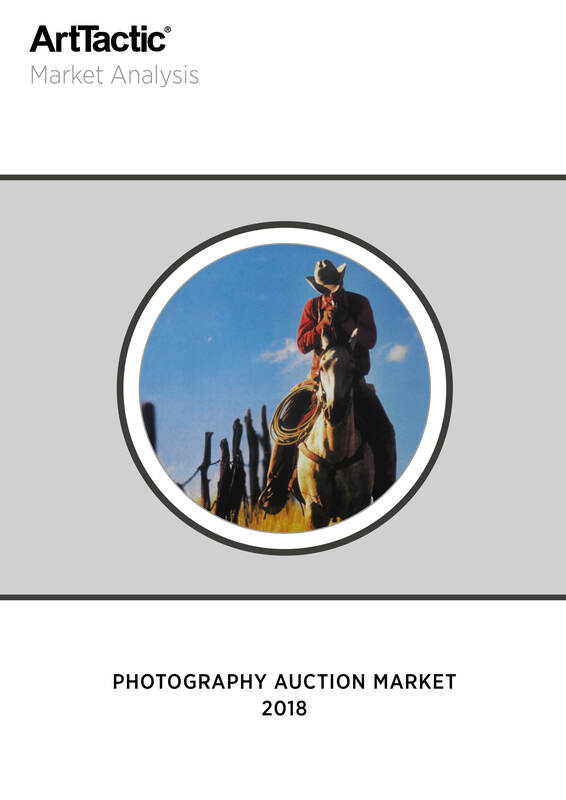 This report is popular among dealers, auction houses and collectors, who want to get an in-depth understanding of auction trends in the photography market and follow the performance of the three top auction houses last year. ArtTactic also offer bespoke reports on the Photography market. For further information please contact us on info@arttactic.com. Comparable Performance: Photography sales performance comparison between Sotheby’s, Christie’s and Phillips in New York, London and Paris including: Total sales, Lots sold, Average Prices and Auction Indicators. Top Artists Analysis: Section looking at the top 20 artists sold across all sales channels. 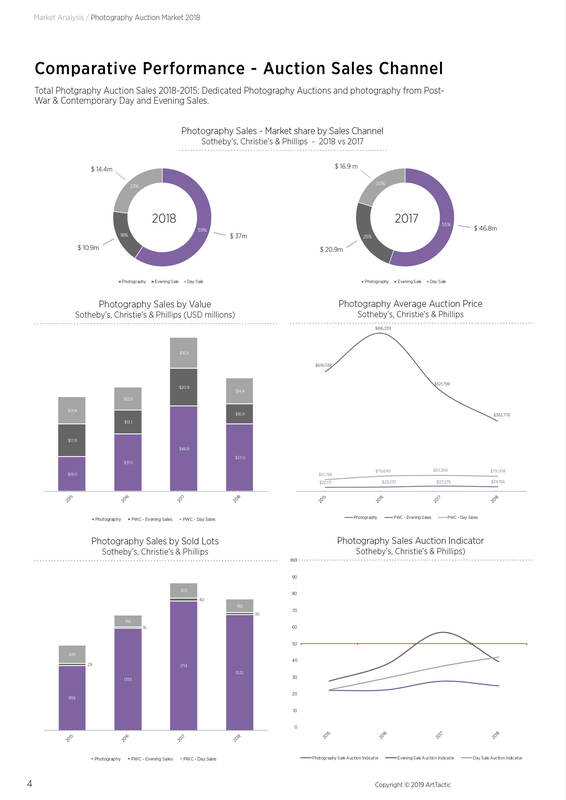 Photography Sales Channel Analysis: Photography sold at auction across all three sales channels with breakdown, analysis for and top prices.